Want to learn Android development? Are you ready to develop an android app? There are various benefits of being an android developer in the booming app industry. If you are an absolute beginner, you can learn how to build Android apps from specific android app development courses for beginners. There are several android app development courses available which can enable you to accomplish your dream in a matter of weeks. 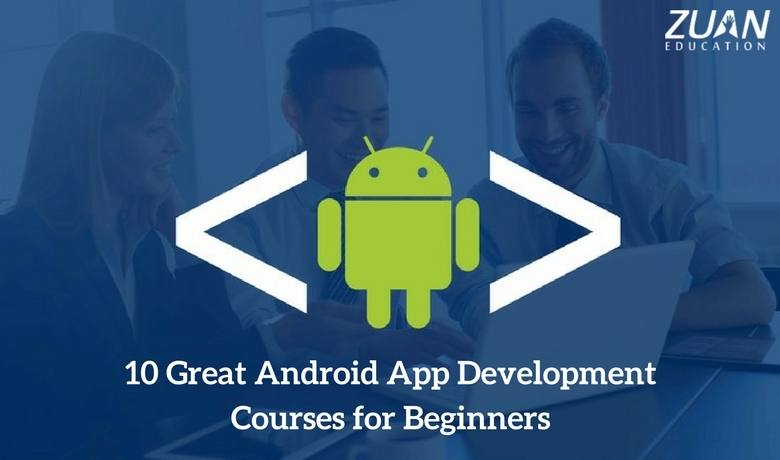 Here we listed the 10 great android app development courses for beginners. It will allow you to learn how to develop new Android applications. It is one of the best android app development courses for beginners. This official video training module designed by Google. And it also supports developers to learn Android app development from scratch. Right from developing the most basic application to building apps with content sharing, cloud connectivity, multimedia, and location. Once finished with the fundamentals, you can also build apps for auto, work, TV, and wearables. Objective: Learn the essentials of Android app development and beyond. Xamarin also provides a live course in android app development with endless access. It implies you can schedule a class session in your timezone as frequently as you prefer. On finishing the android development course, you can take the Xamarin Certification Exam for no more cost and become a Xamarin Certified Android developer. Objective: Introduction to the Android platforms and getting started with cross-platform android app development in Java. Access to the Xamarin Studio. Basic knowledge of programming in Java and C#. Cost: INR 1,27,779 per year. This Android development course combines the fundamentals of Android app development in practice and theory. You will try many projects in this course to learn the principles, tools, and patterns that hold Android development. Before the finish of this app development course, you will learn how to develop a cloud-connected android application. That also has rich and responsive layouts and handles content providers and loaders to continue and recover data. Objective: To know the best practices of android application development. Experience in programming with Java or any other object-oriented programming language. Cost: INR 12,745 /month after 14-day trial. This android development course explores the different components which make mobile devices distinctive regarding design and UI. Coding a mobile application is practiced as a part of the course with the essential focus being on designing and appraising a unique mobile experience. As a combined advantage you get the chance to share and discuss your project with android developers from around the world. Objective: To know the HCI design process, develop a unique android application and evaluate its use in daily life. Experience with Java or Objective C programming. This android app development course includes the fundamentals software applications developed for handheld devices. The essential focus areas of the course are application programming principles, user experience attention, and software architecture. On fulfillment of the course, you will be able to develop your own Android application and master related development abilities. Objective: To give a basic knowledge of designing and implementing Android apps for smartphones and tablets. Access to the Android Studio. This android development course gets you begun with Android development and guides you everything about building applications with Java. You will learn the fundamentals of Android Studio 3.0, take on 10 interactive projects, and publish your app to Google’s Play Store. Objective: Help beginners build their first Android app. Cost: INR 32,025 per month. Need a certified course that you can include in your profile? The Alison app development courses are entirely free, and they drive you through the entire development process from beginning to end. It is one of the best android app development courses for beginners to intermediate coders interested in Android and game development. Objective: To know the best practices of android application development in particular. Mybringback provides android app development course for beginners with best practices. It also has a lot of useful concepts especially with it comes to working with the fundamentals. This android development course will have you up and running in a matter of days. Objective: To provide a basic knowledge of creating and implementing Android applications for smartphones and tablets. Knowledge of programming with Java or any other object-oriented programming language. This Android app development course offered by Professor David Janzen of Cal Poly. This practical course will help you through working with Java. Objective: Learn the essentials of Android programming and beyond. Basic understanding of Java or any other object-oriented programming language. Gabor Pellar, an ardent Android developer. He has created a diary of his experiences with the development process. It is not intended to be a tutorial or guide, but it can surely help as a great resource. Pellar documents a large number of his musings alongside his working process. It is also one of the best android app development courses for beginners. Objective: Help beginners to create their first Android app. Learning android app development is the initial step towards building an efficient and successful application, and setting the right budget is the next. There are numerous courses available online for those who willing to learn android app development. After reading this article, you should be able to find at least one course to guide you in android app development. Have you come across any great Android development courses recently? If yes, let us know in the comments.